List of the models available for free downloading. 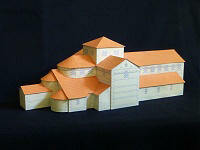 All these models are original and provided as PDF files. Read the tips for the process to follow with these files. 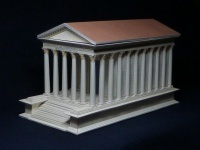 This famous Roman temple of the Augustan era has survived the centuries in a remarkable state of preservation. 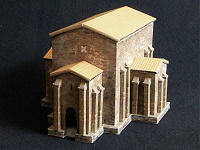 Built in the early 1st century, it was used for the imperial cult. 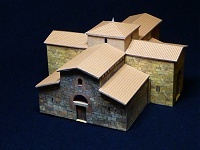 The model has a removable roof revealing the pronaos and the cella. This pretty little Spanish pre-Romanesque hermitage is the remaining part of a much larger 7th century Visigothic church. Its interior and exterior decoration is remarkable. This Spanish church dates from the end of the Visigothic period (7th and 8th centuries) and is the most complete and best preserved of this period. 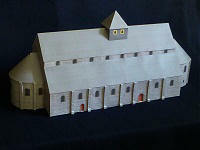 It was moved and reassembled from its original site due to the erection of a dam. This beautiful double-wheeled mill from Basse-Cornouaille, in western Brittany, is a former communal mill from the Ancien Régime and shows a remarkable aristocratic type of architecture. 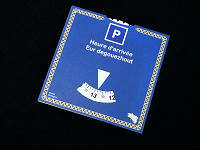 Parking disc at the legal French size 150 x 150 mm, 100% paper, with French-Breton bilingual text. Indispensable stuff for your next trip in Brittany! Nb: object in relation to the free document "Bombard How to". This rural church in eastern Britain has an ancient nave with an elegant frame bell tower, contrasting with the large transept and choir with cut sides that are much more recent (late nineteenth century). 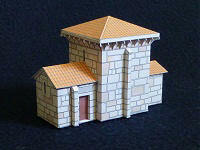 This small church of the ninth century is a masterpiece of the Asturian Pre-Romanesque art (northern Spain). It is classified as World Heritage by UNESCO. 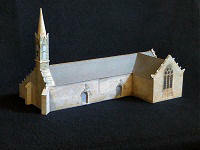 The model has a removable roof to see the complex inside of the nave. 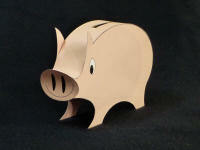 A traditional piggy bank that you won't need to break to get the models from this website since they are all totally free! 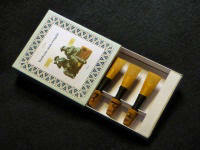 Reinforced box, to accommodate three reeds for the bombarde (traditional Breton oboe) or other near sized reeds. 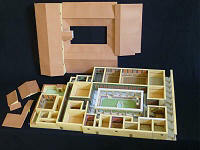 Nb: object in relation to the free document "Bombard How to"
[ More box sizes and decorations... ]. This famous church is a masterpiece of the Romanesque art and a very representative example of the style of the Romanesque architecture from Auvergne, in central France ("massif barlong" on the transept crossing, blind nave with inner galleries and outer arches, etc.). Originally, this Breton chapel was possibly a Templar or Hospitaller chapel although no ancient document will allow to formally attest it. However it was modifyed thereafter. An equatorial sundial, with tilting holder and rotating disk, thus easily adjustable for latitude, longitude, official time and equation of time. 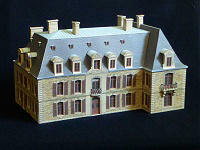 This elegant small Breton castle from the 18th century is well known in Britanny as beeing the site of the annual championship of traditional Breton music players, every early September. 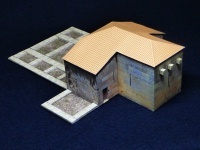 Restitution from the available archaeological data of an urban house of the Gallo-Roman era. Although located very north, its style is typically Mediterranean. 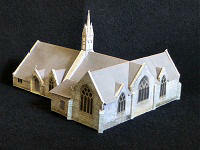 Model with removable roof to see the innner partitioning. This tiny chapel is a jewel of the Mozarabic art in Galicia (Spain). 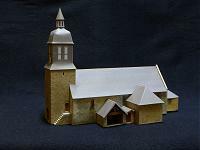 The term "Mozarabic" refers to the style of Hispanic Christians medieval buildings constructed in the areas at this time under Muslim occupation. Like many chapels dedicated to Mary Magdalene, this chapel from the Pays Bigouden, in western Brittany, was once associated with a leprosarium. 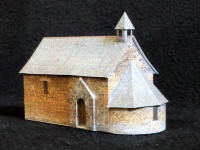 Looking like a old barn, this modest chapel, formerly inside a priory, is one of the oldest chapel in Britanny. 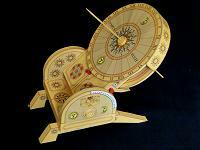 It has a rare and remarkable chevet which difficult to date but whose style recalls the Carolingian era. 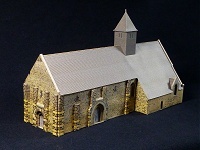 Restitution of the formet cathedral of Alet (now St-Servan in St-Malo, Brittany) based on the remaining ruins and available archaeological data. 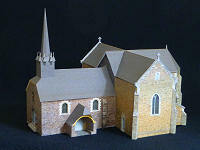 This big pre-Romanesque building, today in ruins, was noticeable for its two apses, West and East. 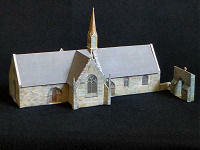 The nave of this rural church was originally the former chapel of the castle, then it became later the parish church. The castle today disappeared. This beautiful chapel from the Pays Bigouden in western Brittany is an important place of the revolt of the Bonnets rouges during the 17th century in Britanny. The "Code Paysan" was proclaimed in front of the chapel, a kind of prelude to the French Revolution. 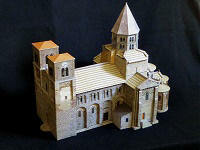 Restitution attempt, based on available archaeological data, of the former abbey founded in Maxent by Salomon, the last king of Britanny in the Carolingian period. Romanesque church belonging to a very homogeneous local architectural group and specific to the Pays des Faluns (upper valley of Rance river) in Brittany. Our Lady of Penhors is the patron saint of the Bigoudens and this coastal chapel of Western Brittany is each year the location of the Great Pardon des Bigoudens (traditionnal Christian festivity typical of Brittany). 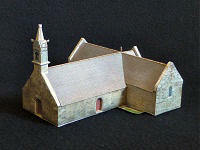 This tiny chapel is the oldest chapel in Britain. 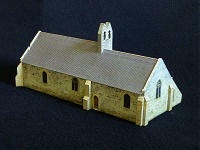 It was established in the former home thermals of a Roman villa now disappeared. 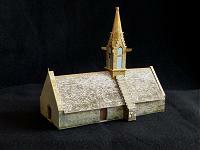 Coastal chapel from the Pays Bigouden in western Brittany. 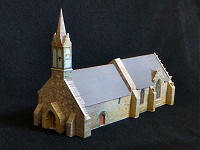 Like some other chapels in this area, it is devoid of western portal. 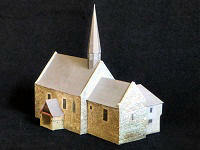 Small chapel from the Pays Bigouden in western Brittany. Evidence of the ancient cults of the water, it was not built next to a fountain of devotion but on a fountain. 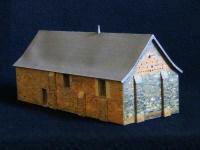 Small coastal chapel from the Pays Bigouden in western Brittany. It was built near a protohistoric stele that the tradition interprets as the "Boat of St-Vio".